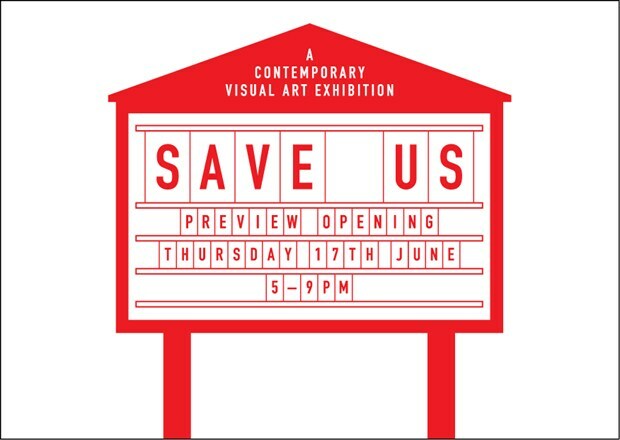 Save Us is a contemporary art exhibition featuring the work of ten emergent to established artists. Selected and curated on the connections of the artists themselves to the town of Macclesfield, and located in one of the town's oldest churches, Save Us reflects affinities to place, parish and the familiar. Andrea Booker's text piece, UNITE, uses reclaimed lettering from the facades of derelict buildings and re orders the letters into reflections on social conditioning and regeneration appropriate to the area in which the signage was found. Ben Cook's digitally printed silk canvas using the famous Macclesfield Stripe design as its reference point is described as being like 'a photograph of speeding objects, or a concrete spin with mere traces of colour'. Nick Crowe and Ian Rawlinson's video work England's Glory presents a contrasting view of nationhood through a continually igniting and extinguishing burnt- out pile of England's Glory matches to the soundtrack of the popular patriotic hymn, I Vow To Thee My Country. Ian Davenport's paintings Poured Lines reveal an unconventionality of method and process. Influenced by musical scores, the repetitions of vertical lines of various colours create a rhythm that merges and overlaps into abstraction. Hilary Jack's Broken Cortege Leaves Devastated Arcadia is a site-referential installation consisting of broken figurines, collected from charity shops and eBay, saved from the brink of oblivion, they are repaired and fused with found objects and mounted on plinths of wood collected from Macclesfield Forest. Ralph McGaul's new mosaic work Death Size considers the dark twists of human character and thwarted ambition that first necessitated and then shaped the erection of Christ Church and its burial grounds. Mit Senoj's new drawing work Alterpiece borrows from the authority of historical anatomies and medical dissections to create new mutations and chimera. David Shrigley and Chris Shepherd's scribbled and strangely funny animation Who I Am & What I Want portrays a highly unsettling examination of the human condition that leaves us not only to assemble the main characters identity but also to question our own. Jen Southern's new series of silk maps and associated walking tour, reference Macclesfield's production of silk for WW2 escape maps and parachutes. Daniel Staincliffe's Fauna Automata presents a series of images taken by specially constructed cameras that enable wild animals to trigger their own photographs.